When the topic of Burgundy pops up in a conversation, focus will more often than not be on the villages of the Côte d’Or and their lieu-dits, premiers crus and grand crus. Nonetheless, excellent value can be found on other appellation levels as well, sometimes even moreso than in overly hyped crus. Don’t forget, grand and premier crus only make up about a tenth of the entire Burgundy wine production and it is really the regional appellation level that is most important to overall output. For instance, the Hautes Côtes surrounding the Côte d’Or are in my opinion not always given the credit that they deserve. Altitude is the most important differentiating factor as the name implies; full ripening, and thus the harvest, generally takes place later than in the Côte d’Or, even though global warming has made this less of an issue in recent years. 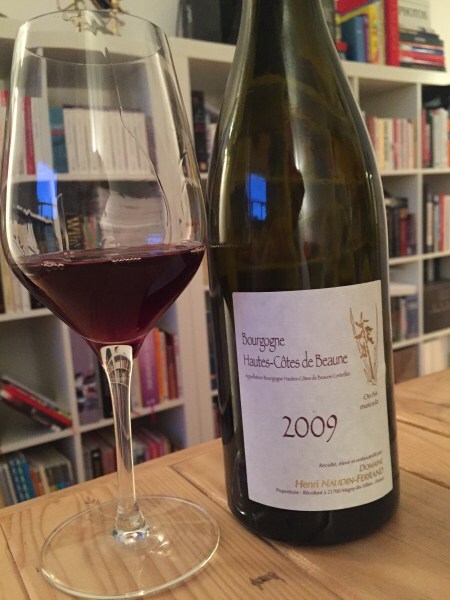 During our Burgundian trip in April we had lunch at Claire Naudin’s place. Unfortunately our strict schedule only left us with enough time for a bite to eat and a quick but interesting tasting of some of the wines that she had on offer, so I did not really get a chance at a proper introduction. I tracked down the Belgian importer a while back and was able to procure a couple of her wines from older vintages to enjoy. Claire tries to work as natural as possible focusing on sustainable viticulture, while intervention in the vinification process is kept to a minimum but not refused by default. For instance, she does not add any sulfur to the wine until the bottling stage, allowing a vibrant retention of the color in her red wines while ensuring stability, not unimportant if you want to ship your wine across the world! Orchis Mascula 2009 is a blend of three different high quality parcels in the Côtes de Beaune. Like I often find with natural wines, aeration is key to lure the wine out of hiding. After some time in the glass a heady floral perfume arises with little red berries, raspberries and rose buds in the background. A medium intense start, but a deep and intense sensation on the palate with tannins present but well integrated, slightly dominated by the juicy acidity that takes over towards the end. It is a subtle, elegant wine that takes a bit of time to show what it is capable of, but the depth and intensity of its flavours, especially in the finish are magnificent!